KEY FEATURES: A sprawling perennial herb with rooting runners. LEAVES: compound with 3 leaflets; LEAFLETS large teeth, smooth above and hariy beneath; FLOWERS: 5 white petals. FRUIT: oval, widest towards teh base, about 25mm long, ripens bright red. The fruit is technically a "false fruit" with the swallen red receptacle bearing seedlike achenes on the surface. 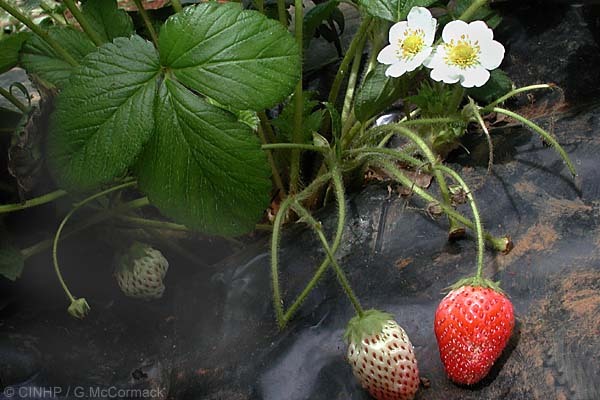 GENERAL NOTE: The common strawberry is a hybrid of the Beach Strawberry (Fragaria chiloensis a native for n. and s.America (and hawaii), and the Virginia Strawberry (Fragaria virginiana) a native of n.America. The hybrid has teh scientific name Fragaria X ananassa.